Looking for Khao Lak accommodation? There are plenty of choices from 5 tar hotels to budget guesthouses. 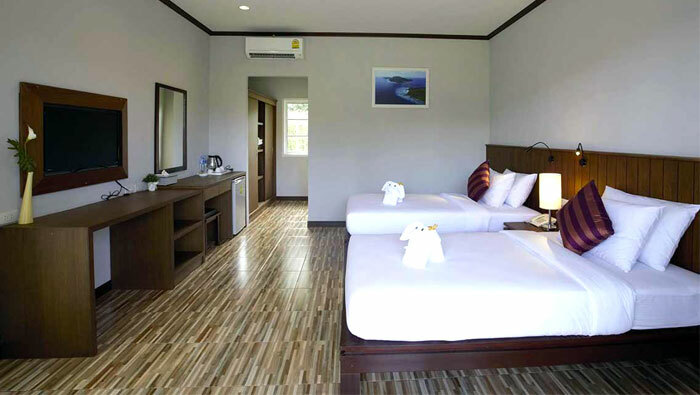 Below is a list of accommodation options near Rawai Muay Thai in Khao Lak. Our friend Van runs the Khao Lak Mountain View Resort, located about 2 KM from the gym. Khao Lak Mountain View Resort is a quiet oasis, away from the hustle and bustle of downtown. Their rooms are spacious, the pool is relaxing. The resort has horses you can ride and an ATV course you can tackle. The resort offers daily transportation to the camp or you can rent scooters to get back and forth. For booking inquiries go to their website. This quiet resort is located near Bang Niang morning market. It is surrounded by lush vegetation and has nice rooms, bungalows and villas for rent. It is about 2 KM away form the main road, which gives it a secluded and quiet atmosphere. Yama Resort offers breakfast to it’s guests and has a lovely pool to relax in. For more information you can visit their website. Suthawan Resort is a short scooter ride from the camp, on the way to Khuk Kak Beach, where we train on Saturday mornings. They have inexpensive a/c rooms with WiFi and a small pool to chill out in. They have monthly rates available. You can get info and prices in their website. Ruk Cozy has a great location, just 5 KM from the camp, near the night market in Bang Niang and the Tsunami Memorial. The owners are friendly and they have great taste: the rooms are modern and stylish and overlook the pool in the center. They also fave a little breakfast restaurant, right on site, with tasty scrambled eggs and real coffee.